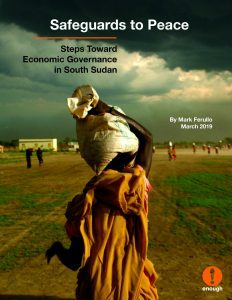 The Enough Project’s new report, “Safeguards to Peace: Steps toward Economic Governance in South Sudan,” published today, surveys how South Sudan’s violent kleptocracy threatens the implementation of the peace agreement. Because financial motives drive so much of the recurring conflict in South Sudan, the new report assesses how economic safeguards can help to break this cycle. The report also outlines 10 anti-corruption policies to counter the kleptocratic practices that risk undermining South Sudan’s fragile peace agreement. Drawing on discussions with South Sudanese civil society and past international examples, the recommendations—such as appointing an AU Transparency Envoy and building an e-Transparency online system—are designed to confront the continued looting of South Sudan’s economic resources. Before the three-year transitional government forms, there is a window of opportunity to advocate for bold anti-corruption policies. A deliberate international strategy focused on promoting good economic governance should be deployed alongside the focused and escalating use of financial pressures, such as network sanctions and anti-money laundering actions targeting the economic enablers of the violent kleptocracy.